Since Mansory bought the Porsche tuning arm of Swiss company Rinspeed, they’ve been trying to combine Mansory’s elegance and prestige with Rinspeed madness. However their first creation shows that it has worked viceversa! Mansory got affected by Rinspeed craziness! They call this Cayenne-based car the Chopster, simply because they have chopped its head! They’ve cut the roof and made it lower by 60 millimeter. But what it loses on the roof, it gains in the fenders! They are now 40mm wider. Add to that the new air suspension which lowers the whole car for 45mm and you end up with this …thing! apart from the design , the other amazing feature of this car is the choice of materials. Mansory is an expert in this field. Doors, hood, sills and all the panels are made of naked carbon fiber! 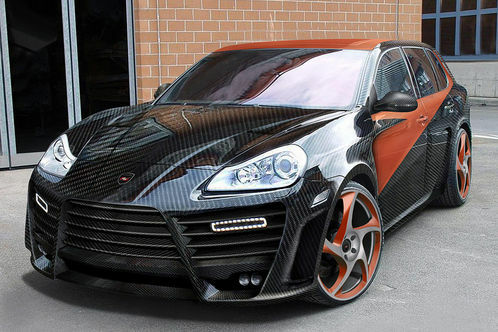 Mansory also has fiddled with the engine. With bigger turbochargers the 4.8 liter V8 in the Chopster now checks out 710 hp and 900 nm of torque! enough to take you to 302 kmh. To stop this monster they’ve fitted 23 inches wheels with brake discs behind them the same size as a family pizza! Interior has received Mansory’s typical treatment which makes it look more like a lounge than a cockpit! The carbon and leather trimming beside features like DVD, Internet access, a number of monitors and a fridge are some of the luxury you get inside.